Norgesic, generic drug name Orphenadrine , is a muscle relaxer (muscle relaxant). 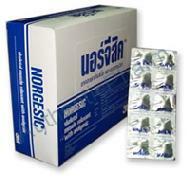 Norgesic is used, along with rest, physical therapy, and other measures, for the relief of severe muscle disorders. Norgesic tablets are indicated for use as an analgesicmuscle relaxant for the treatment of mild to moderate pain and musculoskeletal spasm of voluntary muscle. Appropriate use of Norgesic is for painful conditions where muscular spasm is a component of the pain, such as painful muscular conditions, musculoskeletal spasm, sports muscle injuries and muscle contraction headaches. Orphenadrine acts in the central nervous system (CNS) to produce its muscle relaxant effects. Actions in the CNS may also be responsible for some of its side effects. Orphenadrine also has other actions (antimuscarinic) that may be responsible for some of its side effects. Orphenadrine is a drug which works in the brain stem by blocking certain aspects of the reticular activating system. The Orphenadrine component is indicated as an adjunct to rest, physical therapy, and other measures for the relief of discomfort associated with acute painful musculoskeletal conditions. It works by blocking nerve impulses (or pain sensations) that are sent to the brain. The mode of action of Orphenadrine has not been clearly identified, but may be related to its analgesic properties. Norgesic do not directly relax tense skeletal muscles in man. Take this medication with food or milk if stomach upset occurs. Take it with a full glass (8 oz or 240 ml) of water. Do not lie down for at least 30 minutes after taking this drug.